Let’s get the bad news out of the way first. 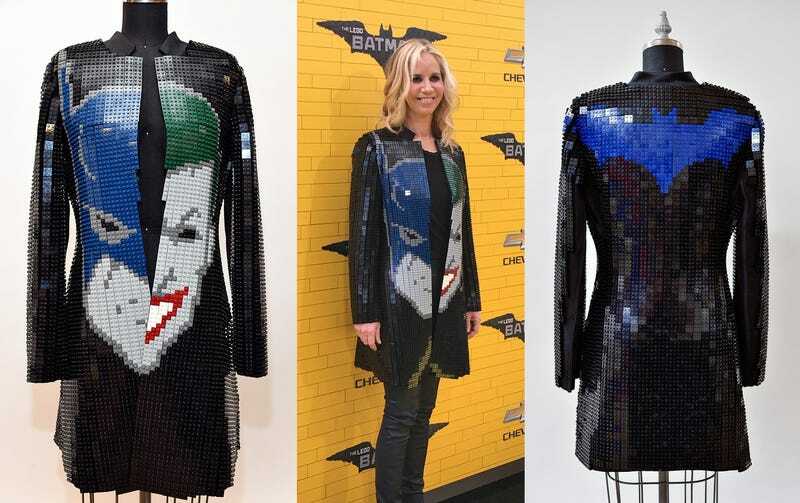 Before you reach for your credit card, this amazing Batman-themed jacket made from over 10,000 pieces of Lego isn’t available for sale. It was a one-of-a-kind creation made to tease every Lego and Batman fan who will never be able to own it. The jacket was custom made for DC Comics president Diane Nelson who recently wore the amazing piece at the premiere of the Lego Batman movie. However, we’re going to assume she took it off before attempting to squeeze into a theater seat as the jacket doesn’t look very flexible—or comfortable. Featuring Batman and Joker on the front, with the Batman logo on the back, the jacket was created by Lego artist Nathan Sawaya who was responsible for a similar piece worn by Her Universe’s Ashley Eckstein at San Diego Comic Con 2016, and a life-size version of the Batmobile assembled from over half-a-million bricks. It took over 100 hours to painstakingly attach the 10,000+ pieces of Lego to the coat, but at least last-minute alterations were presumably as easy as adding a few more strips of Lego where needed.